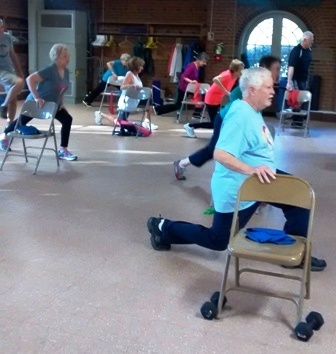 Fitness expert Francesca Fisher and 15 of her older adult students perform the Geri-Fit® evidence-based strength training workout. Rebuild strength, increase range of motion, and improve function of daily living with Geri-Fit®. Each exercise is fully explained and demonstrated. Work out at your own pace. Accommodates all senior fitness levels as well as disabled and chair-bound participants. Most of the exercises will be performed seated in chairs. No floorwork. Requires a set of 2-pound dumbbells or heavier depending on your age and fitness level. © Copyright 2016 Geri-Fit Co. Ltd. Private in-home use only. Public broadcast requires appropriate licensing. Facilities playing this DVD for groups must be licensed. Contact the Geri-Fit office for more info on becoming licensed for intellectual property and copyright compliance requirements.